"A different twist to traditional pizza. Use your favorite BBQ sauce to create this tasty meal!" Place pizza crust on cookie sheet. Spread with barbecue sauce. Scatter chicken over top. Sprinkle evenly with red pepper, green pepper and onion. Cover with cheese. Bake in preheated oven for 10 to 12 minutes, or until cheese is melted. 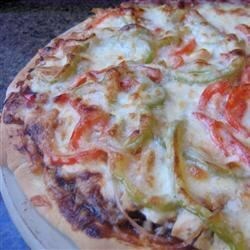 See how quick and easy it is to make a delicious BBQ chicken pizza. The success of this recipe seems to be highly dependent on the BBQ sauce you use - the stuff I used didn't taste that great, but I'll try it again with a different, milder sauce. This was a hit. I may use a little less BBQ sauce next time. I will definitely make this one again. It is such a nice change from the traditional, heavy-on-the-fatty-meat pizzas. Simple, quick and tasty! What more could you ask for?